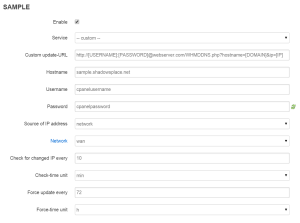 The following script on GitHub gives you a PHP example on how to dynamically update the zone edit files based on a request from a router or internet connected device that needs the Dynamic DNS Name. This assumes you have the domain within your cPanel account as the primary domain, or an Add-on domain, plus that you have access to the DNS Zone Editing tools. You’ll need to adjust the pattern to match the substitution tokens as you see fit. OpenWrt has a DDNS updater available through the means of ddns-scripts. To manually workaround this issue you need to jump into the registry to enable ICS. This is usually deployed via Group Policy on a domain network. As usual, be careful editing the registry. Thanks to Jeff for the find. Netflix and other US-based streaming sites like Hulu aren’t currently available in several countries. As a semi-legit workaround, many blocked countries are resulting to using VPN services or DNS redirection services to get around geoblocks. 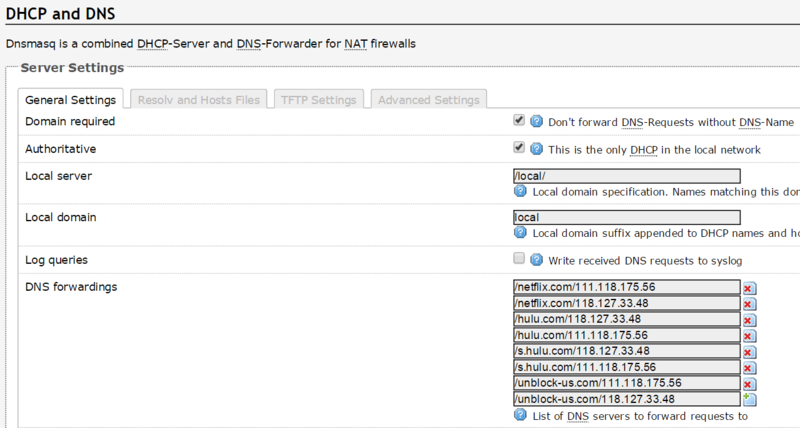 I personally prefer the DNS services over VPN due to the simplicity of the bypass. However, while the DNS settings can be applied at the router level (and automatically apply to all devices), it does mean that all traffic requests are resolved through the remote server. To avoid this, several rules can be put in place on an OpenWRT enabled router to redirect only requests for certain hosts — specifically the ones we are interested in bypassing the geoblock. These same rules can be used for other geo-DNS services other than Unblock-Us, simply substitute the required DNS addresses. The Chromecast doesn’t currently allow users to specify custom DNS settings. 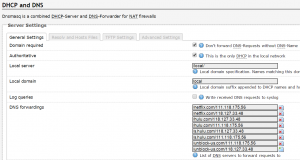 They’re fixed to the Google DNS service, but we can utilise custom Firewall rules on OpenWRT to redirect the requests to specific DNS requests. This doesn’t achieve the per-host redirection, but at least limits it to the Chromecast’s traffic. Below are a collection of Youtube videos that make up a playlist of auto-tuned news. A link to the Youtube playlist can be found at the bottom of this post. Some of the videos take a little while to get ‘going’, but most of them have picked up a pretty good beat in the second half of each song. And so, that is why I am posting what I have found so far; in-case someone else has this issue as well… All the troubleshooting steps are assuming an install of Internet Explorer 8 with Windows 7. SSL Certificates arn’t able to be checked for revocation on Windows 7 Professional 32-bit and 64-bit RTM. The problem appears to affect multiple applications, all of which rely on SSL. This error occurred again once when having installed the proxy application, WideCap. The solution that fixes the issue is simple; in an elevated command prompt ‘netsh winsock reset‘. These are the following steps I took in order to try and resolve the problem. Go into Internet Explorer > Internet Options. On the General tab, under Browsing History, press ‘Delete…‘ then, selecting all options followed again by Delete. Running a virus scan to ensure nothing malicious was causing the issue. Unfortunately, those steps did not resolve the issue. These following, more drastic steps seemed to resolve the issue. I cannot attribute a fix to a specific step they were all performed together. Go into Internet Explorer > Internet Options. Change to the Advanced tab. Press ‘Reset…‘. Then ‘Reset’. In an elevated command prompt, type netsh advfirewall reset, then press Enter. In an elevated command prompt, type netsh winhttp reset proxy, then press Enter. Then, type netsh winsock reset, then press Enter. The issue affected various applications as noted in the summary. This is the following steps I took to resolve some of the applications and their errors. Disabling revocation check in Internet Explorer options.Go into Internet Explorer then Internet Options, changed to the Advanced tab. Scroll down to the Security section. Uncheck ‘Check for server certificate recovation’ and ‘Check for publisher’s certification revocation’. Note: This reduces web browsing security substantially on the system and therefore finding a solution was a priority. So what caused the issue to occur? This program tunnels programs that don’t support proxy protocols through just that, a proxy. This program may have somehow affected the WinHTTP or WinSOCK areas of the operating system. I will continue to use this application to see if the problem regresses. This issue occurred once again and could be attributed to the WideCap installation noted above. I hope this helps someone who has a similar problem, as unfortunately I couldn’t find the issue reported anywhere else on the internet. I was browsing around the other day, and accidentally mis-typed a URL and was re-directed to a ‘Yes Optus’ page with search results from Yahoo based on my query. The good thing is that Optus provide two opt-out methods. 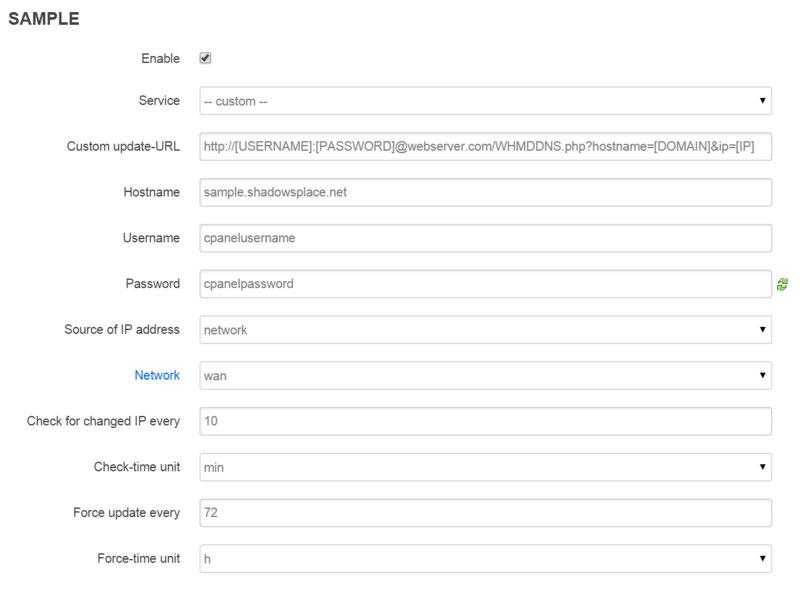 The first is the simpler of the two, leaving a cookie which bypasses the DNS Assist service. The other option requires alterations to your internet connections’ DNS servers, which is a more technical, but also more permanent solution. The cookie opt-out and alternate DNS settings can be found by clicking the “About this page” link on the bottom right of a DNS Assist transition page. 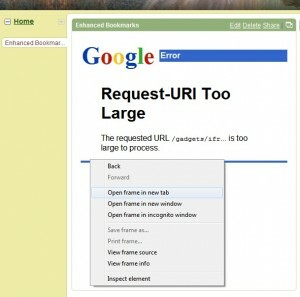 Recently, the Enhanced Bookmarks gadget has been un-usable due to un-expected changes made by Google to its Gadget API. 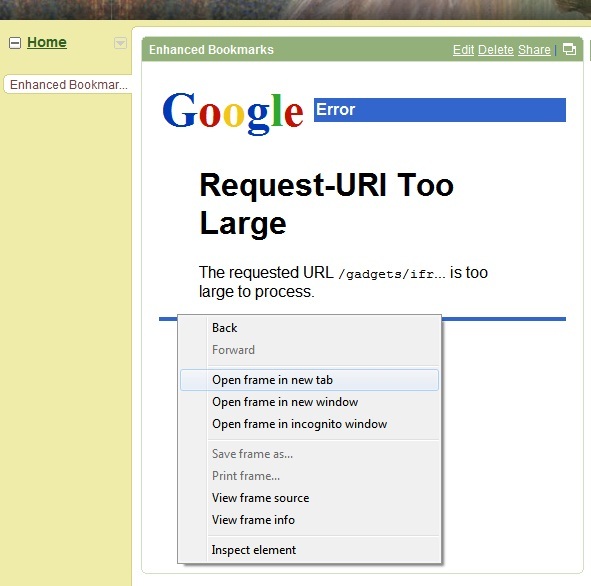 This has rendered Enhanced Bookmarks useless and users are unable to retrieve the bookmarks they had stored. There are two possible ways to retrieve your bookmarks. For some, both methods may work while sometimes only one of the methods will work. The steps below outlines one possible method for you to retrieve these bookmarks. A simpler method has also been created, which can be found below. Let others know through comments on this post if either helped you obtain your bookmarks. Note: You need to use Google’s base domain, http://www.google.com/ig. Canvas view is not avaliable in some localizations (Thanks Anon from Google Gadget comments). Open the Enhanced Bookmarks gadget to ‘Canvas View’ by using either of the canvas buttons, noted in the picture below. The gadget should open in canvas view however not render, and instead display an error message like the one below. Right click this frame (Chrome, Mozilla) and Open in new tab or equivalent. After replacing the characters you can put the text back into JSON Viewer then press ‘Format’ in the toolbar – this will turn it into a more readble form. Hopefully then you should have a readable, backup copy of your bookmarks, should the gadget not be restored to a working condition. Post a comment to this post should this method work or not work for you. The following is a method from Wolfgang. As noted above, it may work for some people who were not able to retrieve their bookmarks using the steps above. Put the cursor in the recovery textfield below, and paste everything (CTRL V). Press Submit and hopefully you see your bookmarks. And of course, he is absolutely right. Although I would have priced it at about $700 (USD), $1000 (AUD). This comment cleverly preceded a new addition to the Microsoft campaign. Dubbed “Laptop Hunters” (which suggests more of these ads are to come), Microsoft asks an individual to find a laptop for under $1000, and if they find it, they can keep it. Recently when I was investigating Business Systems, it was proclaimed that Apple utilises ‘Differentiation’ as a tactic to set their brand apart- but when you look at the bigger picture, at what price? A highly inflated one. Especially in the current economic situation, people will factor this price tag (with an excessive Apple Tax) into consideration and turn away from Apple and instead towards PC.